It was after the fifth-inning leadoff walk that Apodaca mentioned the idea that saved the game and set up Jimenez for history. At the start of innings, Jimenez, like every starting pitcher, was throwing with a full windup. Throughout his career, Jimenez has been far more effective from the windup than from the stretch, the side-to-the-plate stance pitchers use with men on base. But Saturday, he was more effective from the stretch. That meant less of a leg kick and, on Saturday, more control of his body. “I talked to him between innings and he said he just felt lost,” Apodaca said. “To me, it was night and day the way he was executing pitches. His timing, as far as getting the ball out of his glove, and his delivery to the plate were all sharper out of the stretch. It’s often said that the stretch costs a pitcher 2-3 miles an hour off his fastball, and (considering how easy that is to check) I’ll assume that’s roughly accurate. It is very easy to check, and it turns out that it’s not accurate at all. 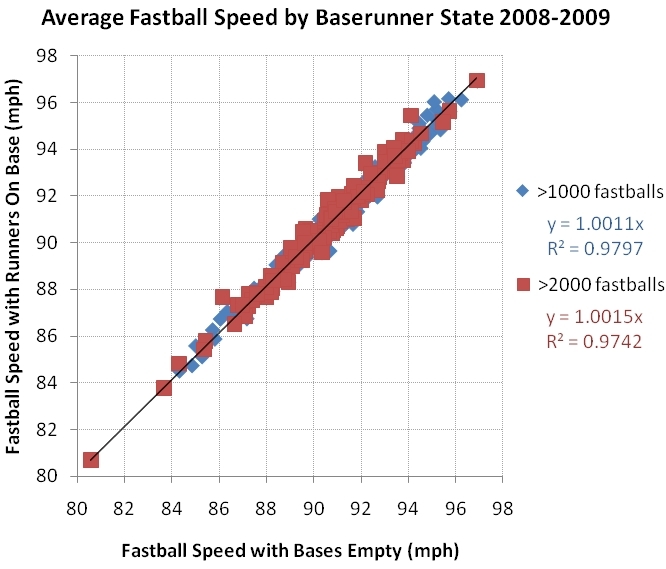 A pitcher’s fastball speed turns out to be almost identical with runners on base as compared to his average fastball speed with the bases empty. If anything, the average starting pitcher throws about 0.1 mph harder with runners on base. Of course it could be that a typical pitcher bears down more and tries to throw harder when there are men on base in order to get the batter out and keep them from scoring. But if pitching from the stretch was a significant hindrance to fastball speed, you’d think we’d see it reflected in the data anyway, even if the pitcher was trying to throw harder. I doubt that the baseball adage that Rob mentioned was merely saying that pitchers end up throwing the same speed from the stretch as from the windup because they’re trying harder. I realize that runners on base vs. bases empty does not correspond exactly to pitching from the stretch vs. the windup for every pitcher, but it should be close to enough to reveal any major differences between the two. I looked at the time period 2008-2009, first at all pitchers who had thrown at least 1000 fastballs, which would include quite a few relievers, and then those pitchers who had thrown at least 2000 fastballs, which should be mostly starting pitchers. The results were not markedly different between the two groups. What about Jimenez in particular? He has averaged 95.7 mph with the bases empty and 95.6 mph with runners on base. The two starting pitchers who really crank it up with men on base? That’s Justin Verlander–94.1 mph with the bases empty and 95.4 mph with runners on–and Ted Lilly–86.2 mph with bases empty and 87.7 mph with runners on. And a virtual cookie (your favorite kind, of course) to the first person who can pick out Jamie Moyer’s dot on that chart. It’s the far left one for Moyer. Is it the far right one for Joel Zumaya? A cookie to Kenny! What kind would you like? The one at the top right is Broxton. I don’t think Zumaya pitched enough to reach the 1000-fastball cutoff. The major downside of pitching from the stretch is that it’s more stressful on the pitcher’s arm. Greg – Do you have a reference to research that confirms this statement? Cool little study, Mike. Really liked it. My take would be that it’s more tiring to pitch from the stretch. Essentially the pitcher has to do the same amount of work to accelerate the baseball in much less time. Hence more power (work/time) is needed. Physiologically, this is more taxing since a higher level of muscle recruitment is needed. Wow, Broxton’s fastball is that much faster than everyone else that qualified? Anyway, very cool, Mike. I’ve been wondering about pitch differences between a normal windup and the stretch for some time now. Perhaps pitchers practice more from the stretch than from the wind-up getting them more used to and able to throw at the higher speed. When using a slide step though pitchers probably loose velocity but I know that a former White Sox pitching coach worked on getting a lot of Sox pitchers, and Mussina (when with the O’s) away from using the slide step because of the velocity and control issues along with it. Mike – Thanks. I had that ASMI study abstract. I was interested if Greg had a reference to other studies that had come to different conclusions. I guess I am wondering whether it would make sense to abandon the windup for all pitchers. There must be some consistency advantage to be gained from throwing from a single motion rather than two separate motions. I would also think that switching between the two would be more likely to cause injury. Peter, all that my Google search turned up was that paper, plus a message board conversation from 2005 where Fleisig asked if anyone had published research about the stretch vs. the windup. Kingsley responded to Fleisig’s post that no, there was no such published research, but Kingsley had done such a study but hadn’t published yet. Presumably he was referring to the research for the paper they subsequently published in 2008. The major downside of pitching from the stretch is that it’s more stressful on the pitcher’s arm. The “loses mph off fastball” is a myth that has proven hard to get rid of. Given that pitchers pitch worse with the stretch than with the windup the difference must be captured in one of those two things or its all in the hitters. Do they? Not as a group, where the worst pitchers will put runners on base more often and overweight their influence on the sample, but individually (on average)? I’m not saying they don’t, I’m just not sure. I had thought it was indeed the case that pitchers did pitch worse (using the delta method) with runners on base. I can’t remember where I saw the numbers though. It shouldn’t be that hard for someone to wrestle up. Mmmm…peanut butter cookies. Okay, I’ll make a virtual batch. Wakefield didn’t throw enough fastballs to make the chart, but his fastball comes in around 73 mph. The next three lowest points on the graph after Moyer are for Doug Davis, Livan Hernandez, and Greg Maddux. Kenny said… Who is the second-slowest pitcher? Wakefield? 1. His fastball is mid-upper 70s. 2. He couldn’t possibly have thrown 1000 fastballs over two seasons. I thought you were criticizing Mike’s article for “needing a study” to prove Rob’s statement wrong. Obviously I misread your comments. Nick, no not at all. I find it interesting that the pitching mechanics is the same for windup vs. stretch. It certainly does not look the same to my(admittedly untrained) eye. I am going to ask Glenn Fleisig of ASMI to post a comment here about his finding. I feel so stupid right now. 2 a.m. me is not the best edition. It’s surprising that Broxton has that much more velocity than anyone else. It’s amazing what the modern bullpen has done for velocity. In “ooh, look at the pretty picture” news, I find it amusing that both of the far left dots are perfectly pierced at a 45 degree angle by the slope line. Who is the second-slowest pitcher? Wakefield? Well this seems pretty conclusive Mike. Good job. Maybe you could check pitch movement or location to see if there is an effect on those. Given that pitchers pitch worse with the stretch than with the windup the difference must be captured in one of those two things or its all in the hitters. Is it a coincidence that the graph looks a lot like the bat? I find it hard to understand how a wind-up can aid a pitcher in hiding the ball, since a pitcher’s release point is not likely to change from the wind-up to the stretch. The wind-up is, for the most part, something that happens before the pitcher gets into his throwing mechanics. If he can hide it in the wind-up, he’s going to hide it in the stretch, too. I understand what you write, and I understand how all that would be distracting—which is not really the same as hiding the ball. Hiding the ball, to me, would be a product of how the ball gets to the release point. It can come from a very traditional angle, or it can come out from behind a pitcher’s head, or curled in his hand, and so forth. And that would remain consistent in wind-up or stretch. OK, now I see why a pitcher can hide the ball better in the wind-up than the stretch. But do pitchers vary their glove positioning from wind-up to stretch? I always believed that the mechanics from one to the other were very much the same. It never occurred to me that pitchers might purposely use two different throwing motions, even if the only difference is something as minor as the position of their glove hand. That’s a great question to study. How much does a pitcher alter his approach from the windup to throwing from the stretch? The Air Jordan 13 Playoffs will be releasing once more. As of right now the shoe is expected to be making its return on June 20th.